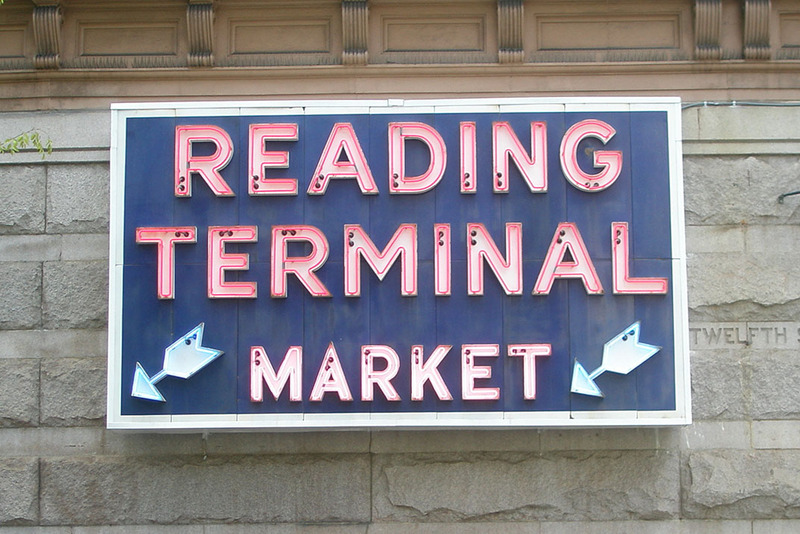 The Reading Terminal Market is one of America’s most successful public markets. There are over 75 independently owned small businesses, offering fresh and prepared foods and unique products that call the Market home. The Reading Terminal Market is a designated historical place and as such, cannot alter the facade of the building in any manner. The basement of the market, integral to the continued success and growth of the sales floor, needed major improvements to keep the space usable. Excess heat from the market tenants’ various refrigeration equipment was flooding the space, elevating temperatures on the sales floor and rendering the basement nearly unusable as a prep and storage area. A solution needed to be found to return the basement to a year round ambient temperature without compromising the historical integrity of the building. 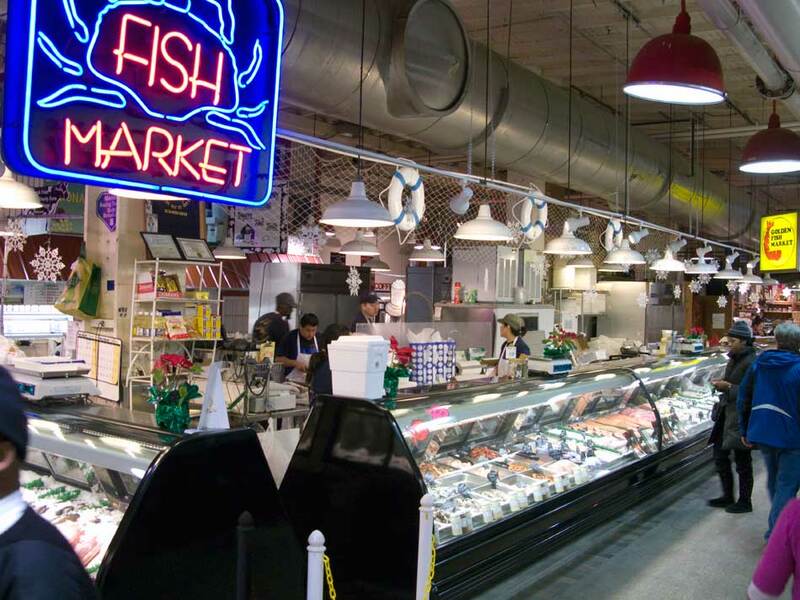 The previously vacant market basement became a popular location for refrigerated storage and walk-in boxes. The basement became a source of revenue for the market that they wanted to develop to its full capacity. Even before considering expansion, the basement was overheating due to the proliferation of refrigeration equipment rejecting heat to the space and they needed a solution. In addition to unbearable working conditions with temperatures measured over 105 F degrees in summer months, the refrigeration equipment was under performing and inefficient. The high ambient conditions also caused premature equipment failures and continuous maintenance headaches. The summer conditions also heated the floor of the market above contributing to the cooling load. Elliott Lewis was retained to provide a design-build solution and engaged Dimitri J. Ververelli as their design partner. 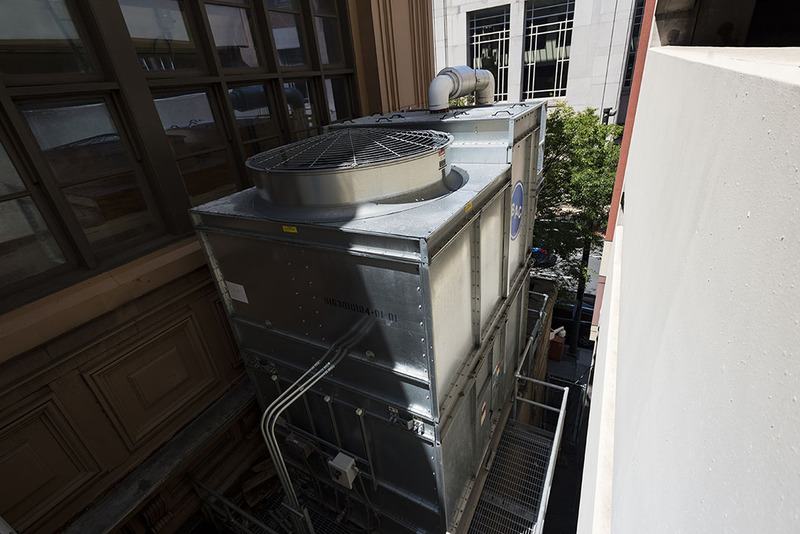 The approach was to design a means to remove the rejected heat from the basement by installing a central cooling loop and converting all of the air cooled refrigeration condensers to water cooled. The loop would consist of an open cooling tower with dual variable speed (VFD) fan drives, plate and frame heat exchanger, redundant cooling tower pumps and redundant closed loop pumps with VFD’s. 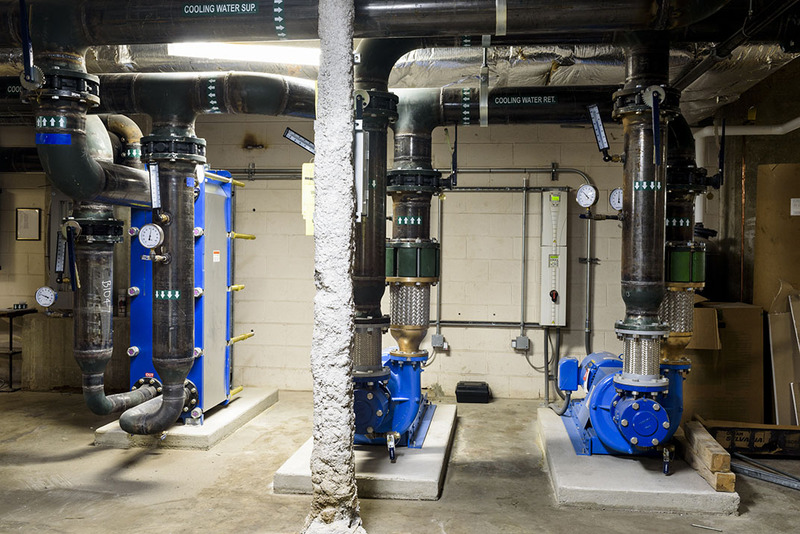 A second plate and frame exchanger was installed with an emergency connection to the PA Convention Center chilled water plant in case the cooling tower loop failed and for routine maintenance procedures. The new building automation system (BAS) provided as part of the project controlled and monitored the new loop as well as the existing building heat pump loop and systems. The existing heat pumps in the market were outfitted with wireless controls to communicate with the new BAS for ease of installation and market floor disruption. The primary challenge associated with the project was finding a location for the new cooling tower that would not impact the markets historical façade. The only space available was on the East side of the building on top of the one-story service entrance, which is not a historic structure. There was just enough space to allow for the selected energy efficient tower option without impacting the adjacent parking structure. In order to minimize the impact of installing a new piping system in an operating food handling facility, a fused joint polypropylene piping system was selected as the most cost effective approach for a loop operating around 85 F degrees. Numerous valved outlets were provided for the existing tenant base and future expansion. 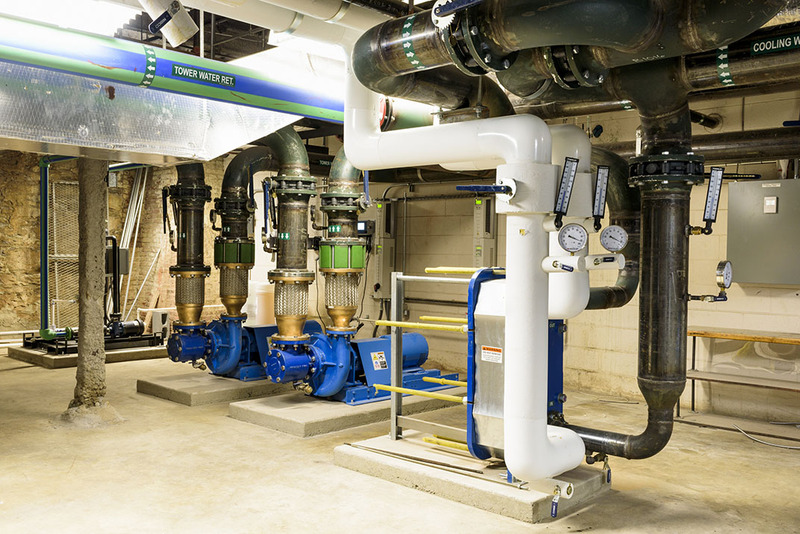 The market tenants were responsible for piping to their new water cooled condensing units, based on the market guide specifications that included water regulator valves, balance and shut off valves. The most dramatic effect is that the basement temperature has been dramatically reduced year round. The overall electric consumption, even though the tenants are sub-metered, has been reduced. Last July it was reported that there were savings of nearly $16,000.00 for that month alone. The tenants are also reporting that their walk-in boxes hold to the set temperatures and recover faster even after repeated door openings where they never could in the past. In some cases tenants found that they could install less refrigeration equipment, because of the improved performance. The initial connected load on the designed 200 ton system was approximately 85 tons. Since that time numerous pieces of refrigeration equipment have been added including some conversions from the market sales floor.